It's December 13th, which means we celebrate Saint Lucia in Sweden today. It's also Friday 13th. But - most of all - it's Fabergé Friday! So here comes a cute dormouse, made around the year 1910! 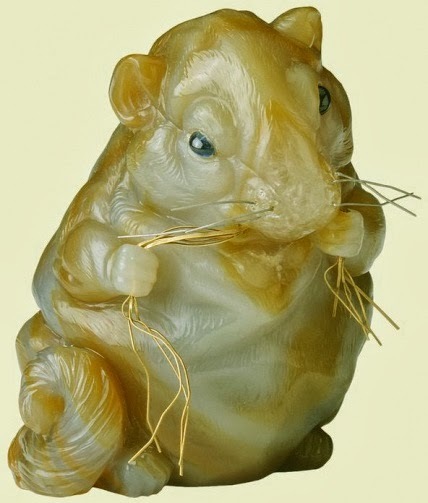 This little figurine in the form of a dormouse is carved our of chalcedony. It has sapphire eyes and platinum whiskers, and is nibbling on a few straws made of gold. The size of the mouse is 2.4'' x 2'' x 2.3'' (6.2 x 5.2 x 5.8 cm), and no other dormouse is known to have been made by Fabergé. It was bought at Fabergé's London branch by Queen Alexandra, consort of King Edward VII, on November 5th, 1912, and is now part of The Royal Collection. This is brilliant Miss Meadows, a Happy Saint Lucia day to you as well!